Host-Telecom Review 2019: Is Host-Telecom a Good Hosting? 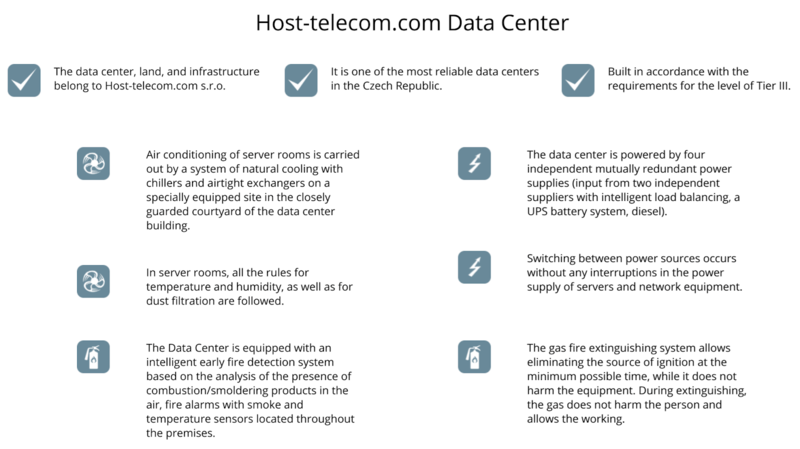 Host-Telecom is a dedicated server, VPS, VDS and colocation services provider based in the Czech Republic. They also offer fully managed hosting solutions to medium-sized and large business enterprises in the Czech Republic and the rest of Central Europe. Host-Telecom is a hosting provider based in the Czech Republic. This vendor offers hosting solutions and colocation services to their local Czech and international customers in Central Europe. With data centers in České Budějovice and Veselí nad Lužnicí, and with more than 400 server racks with 16,800 units, Host-Telecom is one of the leading hosting infrastructure providers. The Host-Telecom website is available in three languages: English, Czech, and Russian. This company’s hosting servers are housed in modern data centers located in the Czech Republic. The data centers are Tier III compliant and are equipped with four mutually independent redundant power sources, tight security measures, and fire and air conditioning systems. What’s more, Host-Telecom’s servers run on hardware from leading manufacturers such as DELL, Supermicro, and HPE. Data is stored in several copies on various independent servers, and backups are also done from physical and virtual infrastructure that uses OpenStack, Hyper-V, VMware vSphere, and Virtuozzo to provide reliable and secure cloud storage and disaster recovery. While Host-Telecom also offers shared hosting solutions, these seem to be something of an afterthought. The shared hosting pages are hard to find, and there is little information to encourage customers to sign up. The same applies to the RapidSSL, Comodo PositiveSSL, and Comodo Essential Wildcard SSL certificates that can be purchased as a separate solution. Host-Telecom’s hosting plans come at competitive prices, with no apparent hidden charges and no significant restrictions. The monthly, bi-monthly, and six-monthly payment prices are displayed in euros, and they exclude VAT. They offer a 30-day refund policy which (as the name suggests) refunds your money if you cancel within 30 days of your purchase transaction. Not all products are eligible for refunds so you won’t get refunded for any managed services, domain registrations, domain transfers or SSL certificates. That said, you can get free RapidSSL certificates for a trial period of 3 months, and in all cases the hosting setup is free. You also get a network uptime guarantee of 99.9%. You can reach out to Host-Telecom’s 24/7 technical support team via live chat, email, telephone, or their support ticket system. The polite and professional team is ready to provide assistance in Russian, English, and Czech. This vendor’s data center support is also available in the three languages, but their knowledge base appears to be only available in Russian. Webmasters looking for hosting solutions and colocation services in Central Europe will be delighted to know that Host-Telecom has both the infrastructure and the expertise to deliver excellent solutions. They have excellent customer support, and their prices are reasonable. Wondering how Host-Telecom stacks up against other Web Hosting companies? Enter any other Web Hosting company and we will give you a side-by-side comparison.